• Did you look at the price? Just the name of this car is enough to pump the word count: Ferrari GTC4LussoT. Like most Ferrari’s Down Under, this car is less about seeing the countryside and more about being seen… There’s little chance of going un-noticed in a three-door hatchback that’s barely 15mm shorter than a Holden Commodore Sportwagon and both taller and wider. And nor is it easy on the wallet. Ferrari GTC4LussoT starts at just over $500K and with 23 options listed on our test car’s build-sheet, the MSRP was an eye-watering $673,211. The individual pricing of some of the options are instructive. Ferrari charges $6791 for Apple CarPlay in the GTC4LussoT. The panoramic glass roof is $32,500. A luggage set that maximises the relative tight luggage space is another $17,650 option ticked on our car. Even the yellow Scuderia Ferrari ‘shields’ on the front quarters are extra – $3100 to be in fact. Of course, it is a Ferrari and there’s a school of thought that suggests the badge transcends any discussions of value for money. I’m not a student of that school – frankly the pricing on this car is usury. You can own both a well-spec’ed Rangie and a mid-engined German sportscar and still have change for the odd overseas F1 GP trip for the same moola. Absolutely a case for expensive horses for courses. I wouldn’t – it’s too big, too expensive and not what I want in a Ferrari. But that’s me and there seems to be plenty of people globally who have a different opinion. The original all-wheel-drive V12-engined GT4C and its predecessor, the FF, have been relatively successful for Ferrari. A large part of the attraction is that it IS a four-seater. And the rear seats are properly usable, in contrast to cars like various Aston Martins which are at best 2+2s, even in their largest iterations. Sure, the LussoT’s rear seats aren’t probably as comfortable as, say, its most logical competitor, the Bentley Continental GT, but they are (surprisingly) a little less claustrophobic, thanks to the hatch-like proportions of the car and the modicum of ‘theatre’ style stepping to the second row. In the front accommodation is luxurious and the front passenger is gifted his or her own instrument panel (of sorts). Dubbed ‘passenger display’ it’s a hefty $9500 option but delivers info like revs, speed, etc. to accompany your screaming! When is it available in Australia? The Ferrari GTC4LussoT was released Down Under in 2017. Given the fact Ferrari is pushing its barrow via social media advertising, this is one Ferrari genuine customers can avail themselves of quick smart– at least in terms of a test drive. Ferrari says you can expect to take delivery of your bespoke LussoT in six to 12 months. For a brand that sometime measures delivery times on its popular models in years that may be of interest to people wanting to shortcut into Ferrari ownership. Bentley’s big coupe has got a couple of mentions here – and it remains in my mind the most logical competitor for the GTC4LussoT. Ferrari says the LussoT is drawing buyers from Porsche, Aston Martin and also from “upper luxury SUV” buyers. It’s worth noting that even if spec sheets are not dissimilar, the most fruit-laden AMG-ed Mercedes-Benz S-Class Coupe or its ilk probably still sits below the Ferrari in terms of prestige, even if performance is likely on a par. Our test drive of the Ferrari GTC4LussoT was a truncated affair so I can’t vouch for the big Italian hatchback’s abilities in the twisties. I’ll defer to my Milan-based colleague Mr Taylor for that part of the testing. It was, however, fast and comfortable on a freeway/highway run from Melbourne down to Phillip Island Grand Prix Circuit and a day or so around Melbourne town. Adjustable dampers deliver a controlled but civilised ride in the comfort settings 95 per cent of owners will choose 95 per cent of the time. With 449kW, and more pointedly, a big swag of the 760Nm peak from even very low revs, the LussoT doesn’t want for performance either. The seven-speed DCT F1 automated gearbox is very civilised in terms of low-speed manoeuvring and even in its most relaxed settings delivers smooth snappy changes in its auto mode. The Ferrari system requires you to choose manual or auto functionality which I think is the way it ought to be. As a practicing motorcyclist, I liked the individual wheel-mounted thumb operated indicator switches the LussoT uses. The cruise control system (which I remembered also disliking on the 458 sportscar) is archaic in its operation. It’s a long-legged beastie though – one that inevitably makes much more sense on the autobahns and autostrada of Europe…. 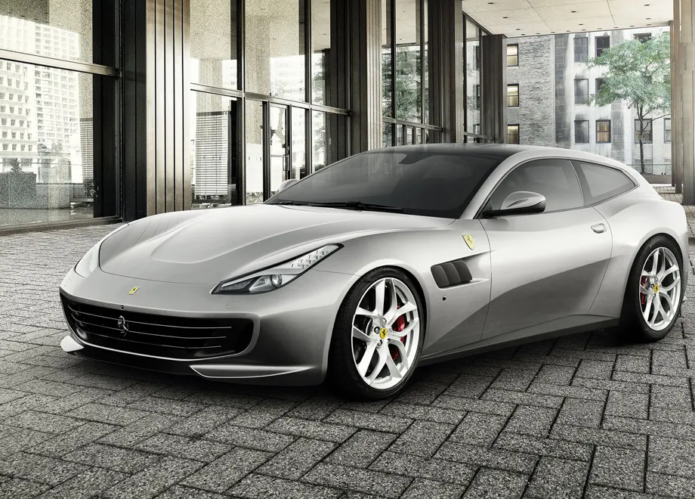 How much does the 2018 Ferrari GTC4LussoT cost?